How many of you have been where I am tonight? The Valentine's Day party is happening at school tomorrow. I have conditioned my children to expect that 'we' (meaning me) do heart cookies as Valentines. And one of D's friends is gluten-free. D says, "Just make one of those coconut cookies. A haystack." Like it's easy to make just one cookie. 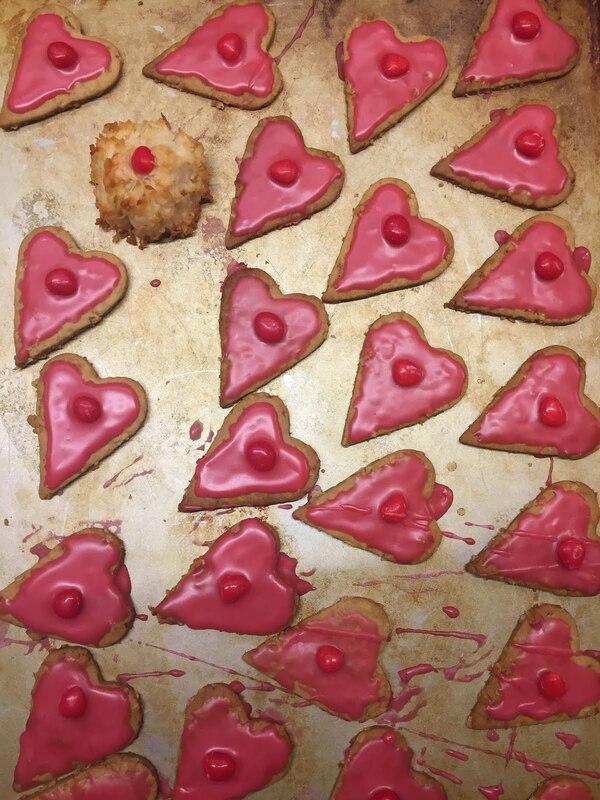 I realized as I was pulling the heart cookies out of the oven this morning that this one child had still not been accounted for. I thought about it three times today, and hadn't come up with the time to address the issue. I got home from bootcamp at 9:30pm and realized that I still hadn't come up with a solution. I confess, I looked for an easy way out. I went to the store, hoping to find a gluten-free cookie that would work for this little boy. do that to D's friend on Valentine's Day. Sometimes the Universe notes my attempt at a short cut, and says, "Tsk tsk. You can do better." There was not a single gluten-free cookie for purchase at my nearest grocery store, which was closing as I searched. I considered just sending him a bag full of cinnamon hearts, but I knew that would appear less next to everyone else's homemade cookies (as would the purchased cookie, if I'm truthful). So I bucked up and decided to make a tiny batch of coconut macaroons. Now that I've done it, I know I can do it again. It took mere minutes, and while I'm waiting up while they bake, it's so worth it to have the option of a tiny batch of gluten-free alternatives for the one person who can't eat the regular cookies. So here it is. A recipe that makes only four cookies. But sometimes, when you just need that one cookie, that's all you need. Place egg white, coconut and sugar in a small, heavy-bottomed saucepan over medium heat. Heat and stir until the mixture begins to dry out and get stickier. You can tell when you're getting close because the mixture starts to look creamy and you can see individual coconut pieces. Once it's sticky, but still moist, remove from heat and stir in the vanilla. Spread out the mixture on a pie plate and place in the freezer to cool for about five minutes. Shape cooled mixture into four equal mounds. Top with a cinnamon heart, if you like, and bake at 300F until golden, about 20 minutes. A. Very "sweet" of you, truly. B. Also great to have this recipe for a quick after-school treat whose left-overs I don't have tempting me for the rest of the week!